Have you ever felt disappointed? Maybe you were expecting something to be different from how it actually showed up for you? I know that in my life, I have learned that disappointment is only something that was not meant to be. I have turned disappointment into knowing that something better is waiting for me. Last week, I had a free ticket to a conference I really wanted to attend. However, there were hundreds of other people who also wanted to attend this conference. There was no guarantee that I would get a seat. After waiting for 1/2 an hour on a mile long line, I decided to head home. I could have felt disappointed but I knew that other things were pressing that needed my attention. So I was grateful for the ability to choose a different attitude. So next time, when the feeling of disappointment gushes into your being, take a deep breath in the knowing that you are being prepared for something better. 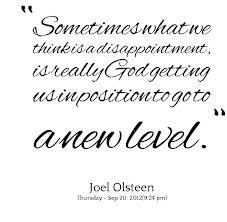 There is an appointment that is waiting for you when you let go of the disappointment! This entry was posted on Tuesday, May 6th, 2014 at 11:36 am and is filed under Art of Thinking. You can follow any responses to this entry through the RSS 2.0 feed. You can leave a response, or trackback from your own site.